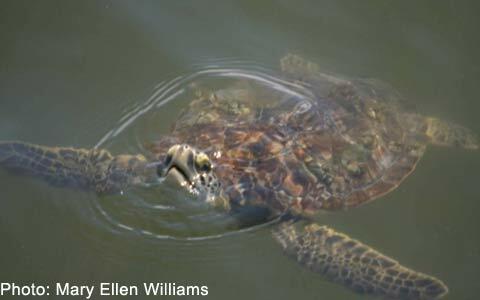 A juvenile green sea turtle takes a breath at the water surface. 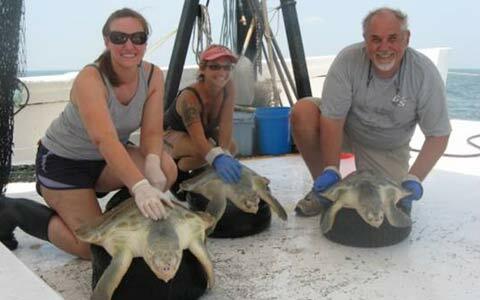 Scientific crew aboard the RV Georgia Bulldog posing with a rare triple catch of juvenile Kemp’s ridley sea turtles. Preparing to release a juvenile loggerhead sea turtle aboard the RV Lady Lisa following data collection and attachment of a satellite transmitter. 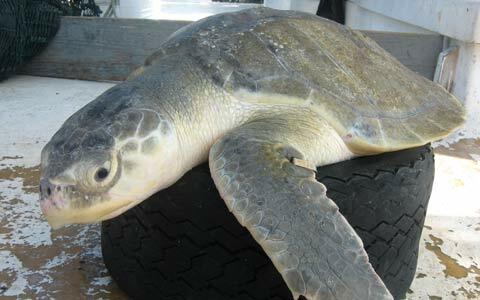 A tagged (metal object on the trailing edge of the left front flipper) juvenile Kemp's ridley sea turtle awaits release aboard the RV Georgia Bulldog. 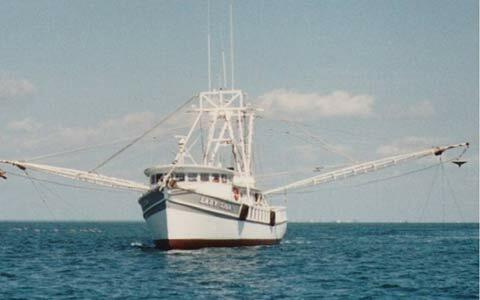 RV Lady Lisa underway, trawling somewhere off the Southeast USA. Scientific and vessel operations crew posing with aka "Cougar." 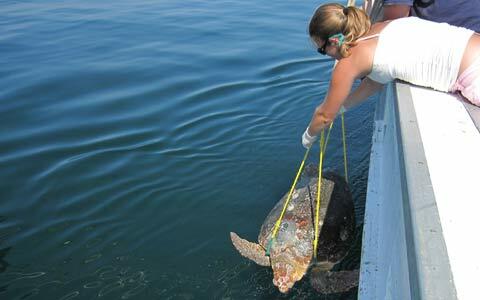 At 380-lbs, this adult male loggerhead remains the heaviest of more than 2,000 loggerhead sea turtles captured. 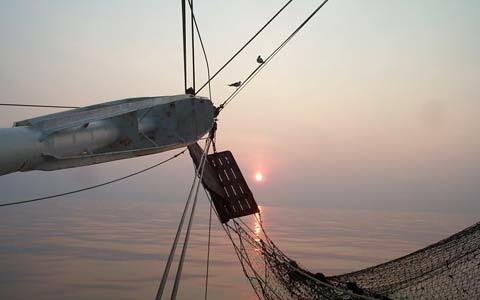 A picturesque sunrise aboard the RV Georgia Bulldog signals that the onset of another 12-hr adventurous work day is fast approaching. As their name implies, sea turtles live in aquatic habitats from which they only briefly emerge to deposit eggs or, in the case of some species, to bask in terrestrial habitats. Therefore, it is critical that scientists study sea turtle populations in the water as well as monitor their annual nest counts on land. Sea turtles are found from estuaries to across ocean basins which poses a challenge to gathering information; thus, mangers must compile lots of locally gathered information in order to comprehend the 'big picture'. 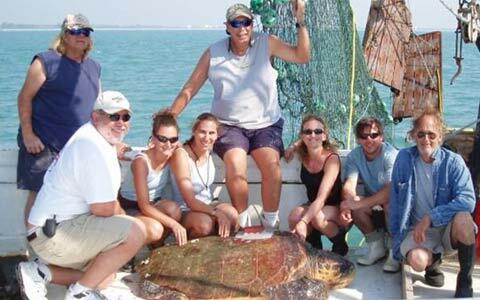 Accordingly, since the 1970's the South Carolina Department of Natural Resources has been a leader in providing important sea turtle data collected in aquatic habitats in the Southeast U.S. The majority of this in-water sea turtle research has been conducted by the Marine Resources Division (MRD) using trawls to capture sea turtles in coastal waters; however, some of the aerial surveys, the stranding network, and sea turtle reporting program managed by the Marine Resources Division - Marine Turtle Conservation Program (MTCP) also provide valuable observations for sea turtle management. This webpage is dedicated to conveying the in-water sea turtle research efforts of the MRD, with information broken down by six central research areas. Information about research methods, funding and permitting, outreach and education, and project personnel are also included.